I had way too much fun transforming the Barbies in our toy collection today. They all went to the hairdresser and now transport glossy hair once again. Just a sec, and let me turn on my best shampoo advertisement voice. Girls! 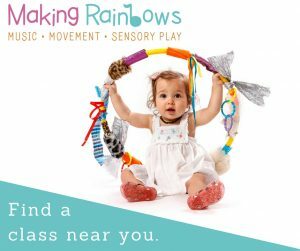 Summer fun in the sun is here! Get rid of hair that’s full of tangles. Say, “NO!” to dry and dull. Turn lifeless hair into shimmering waves with Sparkle in the Sun Shampoo. The special formula will coat your hair in glossy protection so it will be easier to brush, leaving you with lustrous locks that shine. Let your inner beauty sparkle. Flick that hair in the sun. Summer is here, and so is glorious hair. Are you sold yet? Let me show you how to make this “Shampoo”. My kids play with Barbies in the bath often, so the hair gets knotted and yuk. Once in a blue moon, we brush the hair out. I read somewhere about using fabric softener to help remove the knots from Barbie hair and below are the results. Worked a treat! This is how I did it. 1. Measure approximately 1 tablespoon of fabric softener in a mug of warm water. Stir. 2. Place the Barbie upside-down into the mug, and allow to sit for 10 – 15 minutes. 3. 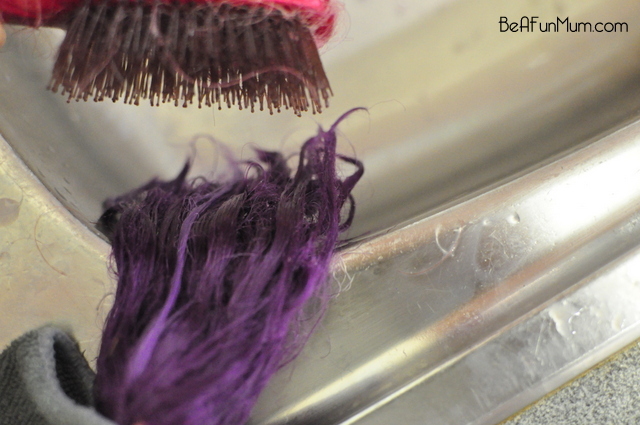 Remove Barbie from water and use a small brush on the back of a sink to brush through the hair. You may need to brush for a few minutes, depending how old the Barbie is and how knotty the hair. For badly knotted hair, I used a little full strength fabric softener directly on the hair. 4. Rinse hair under the tap and allow to dry (in the sun for quick results). 5. Once dry, brush hair again. 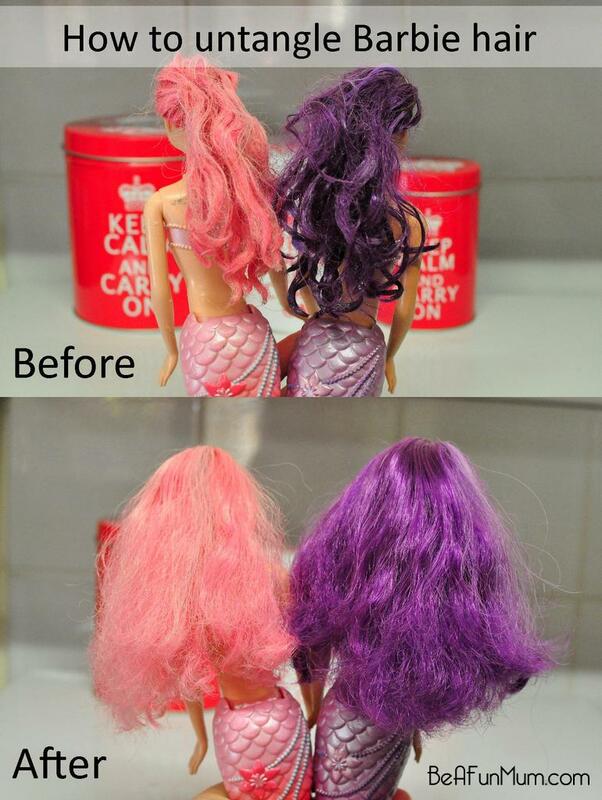 I used this method on Barbies with different coloured hair, and also age. The pink is the oldest Barbie (about 4 years old) and the Red is the newest (about 1 year old). 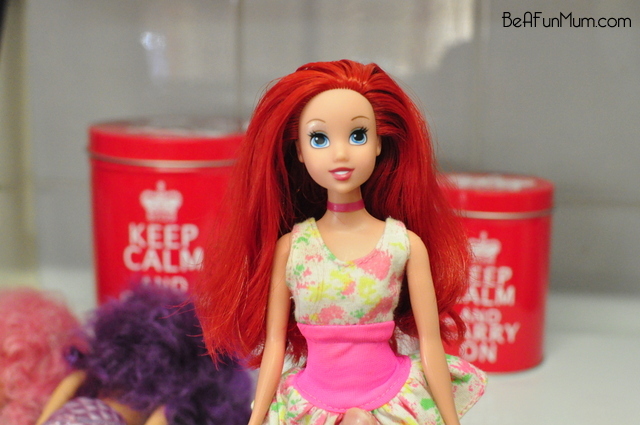 It worked well on all of them, but it was especially effective and easiest on the newest Barbie (Ariel). The fabric softener put a little shine back into the hair and the girls were thrilled with the result, and played with the Barbies all afternoon. Now that’s a GREAT idea! 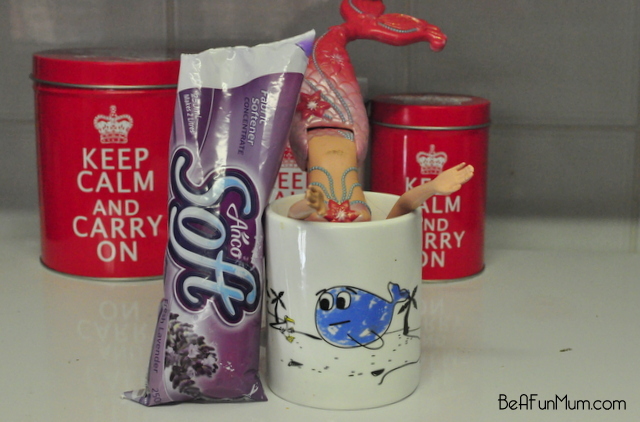 (The photo of poor old barbie upside down in the mug made me laugh and laugh!) 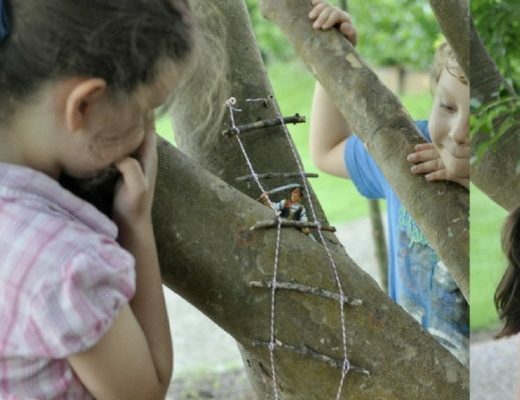 I’ll have to try this on our bath barbies tomorrow – thanks Kelly! Oh, I hope it works well for you! Yes, this is a big problem so thank you for solving it 🙂 So simple, I can’t wait to give it a go. Great tip. My little girl isn’t into Barbies just yet but I’m sure my collection from when I was little could do with this recipe. Thank you. 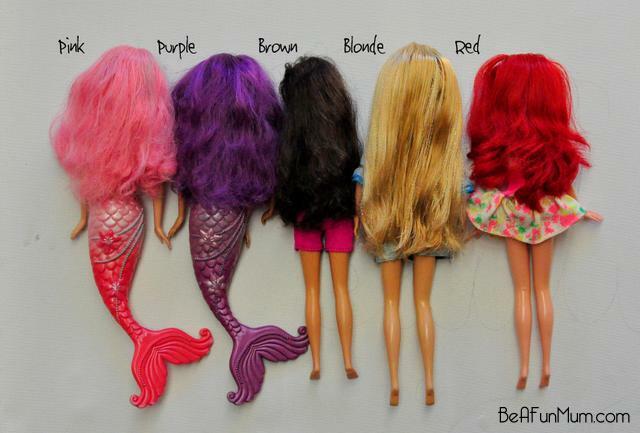 Im sorry but the advice given on dolls hair did not work for me at all, my Granddaughter has 10 Barbies at our home and two, Disney fairies, it was not successful on any of them. 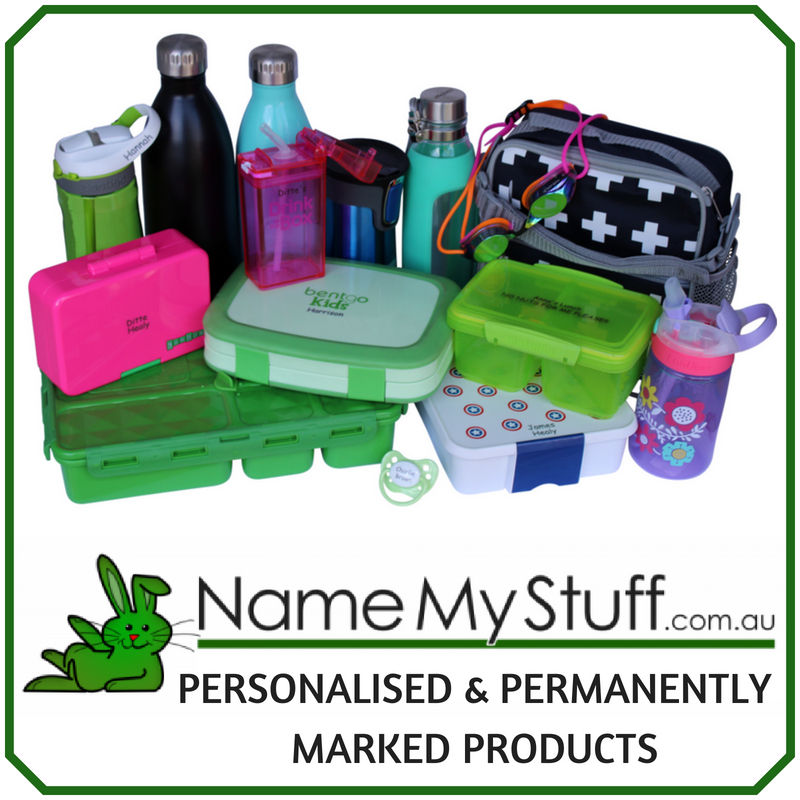 Not successful in getting the knots out, or making it shiny? I found, as I mentioned in the post, that I did need to brush for some time to get the knots out but it did help a lot and put the shine back into the hair. Sorry it didn’t work for you! Do you have any technique to colour Barbie’s hair ???? 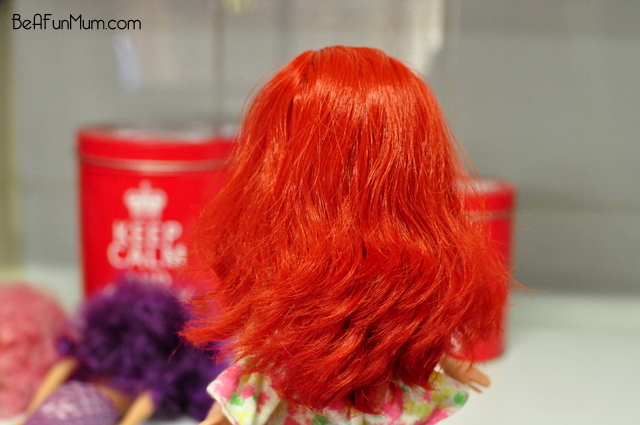 Good tips- here’s something tabby worked AMAZINGLY to restore my kids doll hair- after brushing with the softener mix, you rinse with boiling water (or near boiling) it takes away all the frizz- really was the best solution I found to making the hair look great again.